As you probably know by now, I’m completely cheese mad. I don’t think there’s been a single cheese I’ve tried in my life so far that I didn’t like! In Cyprus we had Feta and Halloumi. The latter was often served grilled with tomato and Lountza (a type of dried, smoked pork). Or sometimes watermelon, which was lovely and refreshing in the summer. 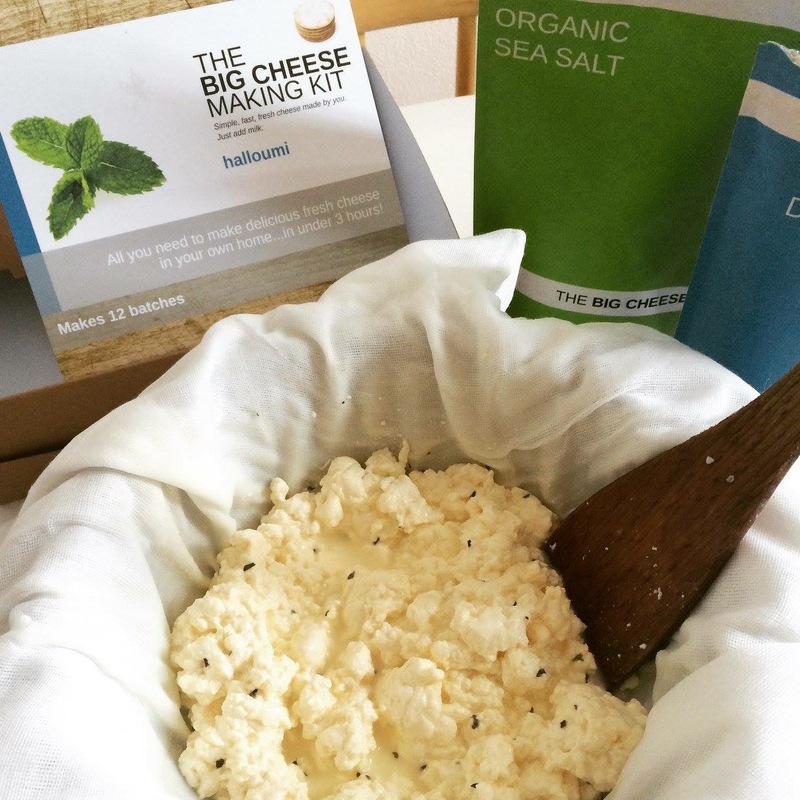 The other day I came across a British company called The Big Cheese Making Kit, that sell a number of kits to help you make your own cheese at home. It’s something I’d never really considered doing, as I thought it would be extremely difficult in a standard kitchen. But when I saw the Halloumi kit, I just had to give it a try! I wondered if it would taste like the Halloumi I used to eat at home, and also whether it would really be worth the effort, as opposed to buying it from a shop. 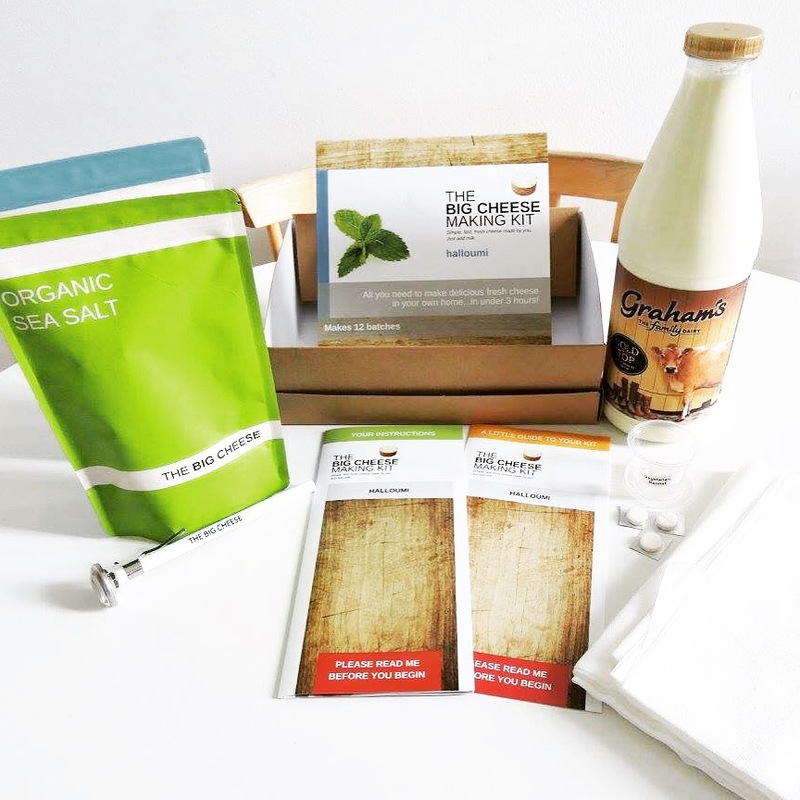 The Halloumi kit comes with vegetarian rennet tablets, organic sea salt, organic dried mint, a dairy thermometer, muslin and the all important instructions! The only thing you need to buy separately is unhomogenised milk (gold top bottles) – I do most of our grocery shopping online and surprisingly found this quite tricky to track down. I eventually found it on Ocado. The kit says it makes 12 batches of Halloumi. And so when it said that you need 4 litres of milk, I stupidly thought that meant to make the entire kit. How foolish, I soon discovered, as this was meant for one batch (you can tell I’m new to this!). Luckily I bought 2 litres, so I just halved the quantities in the instructions and it worked perfectly fine (and we still had plenty of cheese for two, for lunch). As such, whether you use 2 litres or 4 litres of milk, you’re going to need a very big pan to cook it in. I just managed to fit 2 litres into the pan that I had in the house, but it would have been more comfortable to cook in a bigger one. – I mixed an eighth of a rennet tablet in some boiled, cooled down water. – I poured the milk into a pan on the hob and heated it slowly, before moving it into a sink full of water at the same temperature. At this point, I slowly added the rennet. – After 45 minutes, I removed it from the sink and put it back on the hob. I then sliced diagonal shapes into the curd which had now formed on the top of the milk. I heated it up and slowly stirred it all together. – At this point, I separated the curds and whey, using the muslin and a colander, catching the whey in a pan underneath. I mixed in some dried mint at this point and folded the muslin into a bag, putting weight on top of it to drain the excess liquid out of the cheese for just over an hour. – Next, I removed the curds from the muslin and sliced them into pieces. 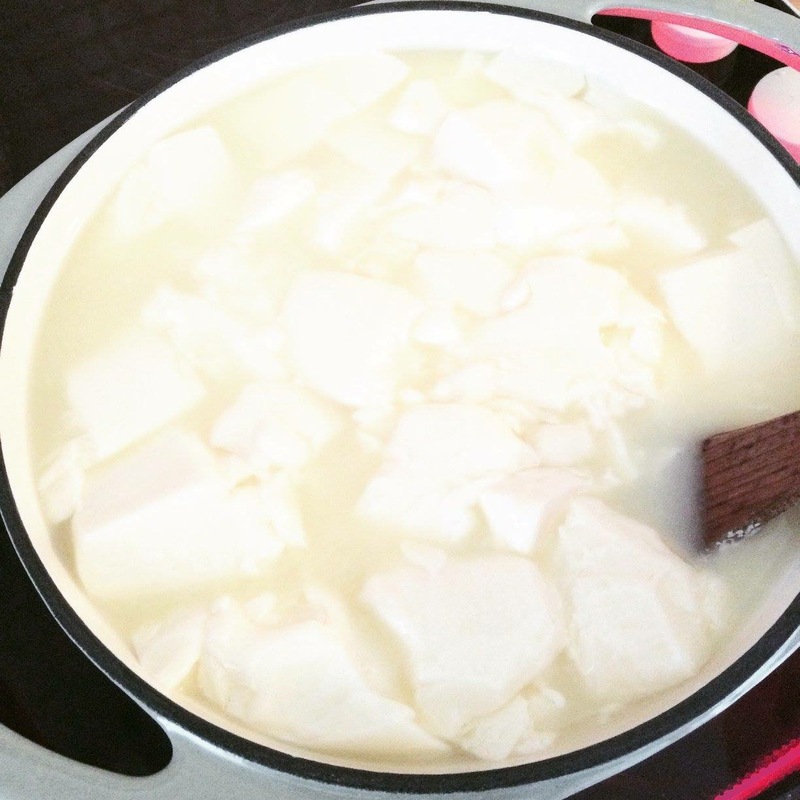 – I then heated up the saved whey to a high temperature before adding the curds and cooking them in the whey. – The last cooking step was to dip the curds in cold water for a few seconds before drying and covering in salt and dried mint. I knew from experience of eating (a lot of!) Halloumi that it’s quite a salty cheese, so I was quite liberal with how much I put on it, rubbing it in with my fingers. And it was absolutely brilliant! 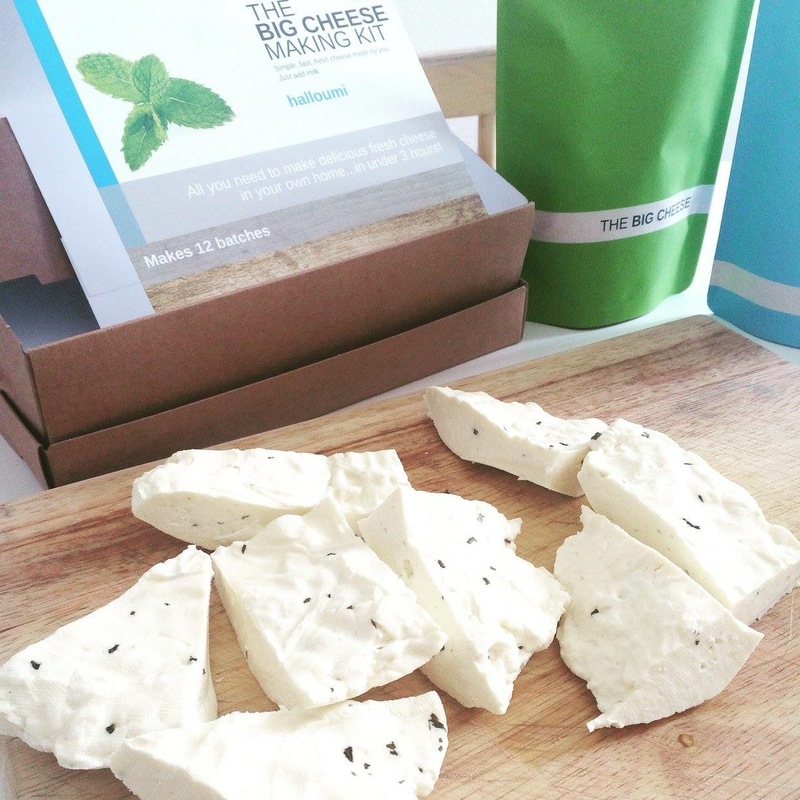 A slightly rubbery texture (that sounds awful but you’ll know what I mean if you’ve tried it – it doesn’t crumble like a cheddar or feta) with a cheesy, salty flavour. Just perfect! I served my Halloumi with bacon as we’re definitely carnivores in our household, but it is 100% suitable for vegetarians otherwise, as it uses vegetarian rennet. It also has a 2 year shelf life, so you have plenty of time to make all of those batches of cheese. I was really impressed with this kit and can’t believe I managed to make it successfully the first time, having never done anything like this before. 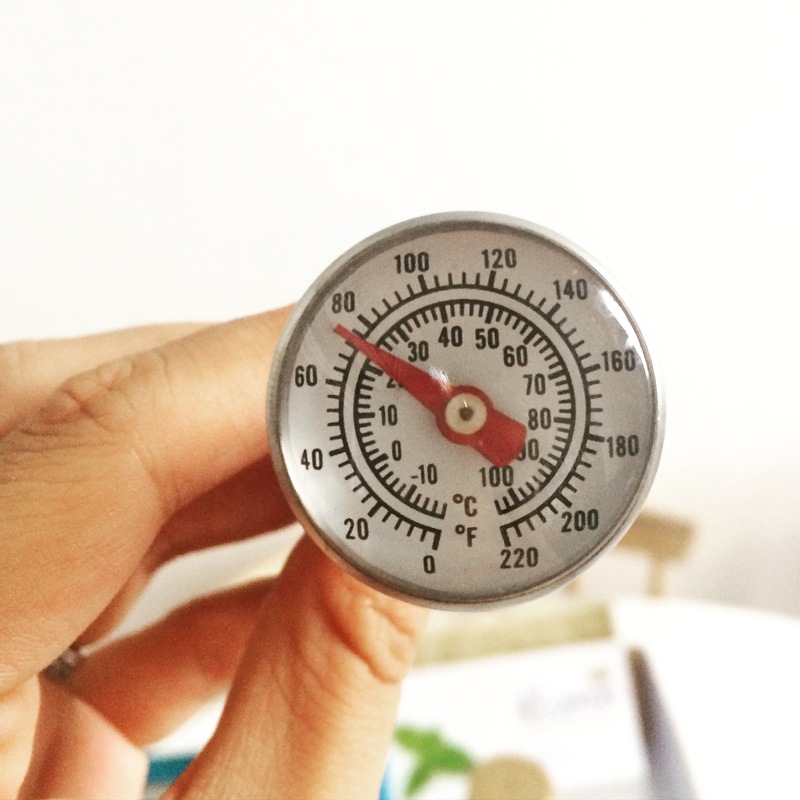 I think they key to success with this kind of cooking is keeping an eye on the timings and temperatures. In the past with certain types of cooking and baking, I’ve been too hasty and have tried to ‘wing it’. You just can’t do that with ingredients like these – it really is a science. The kits cost from £22.50 and are stocked in many retailers around the world, but you can purchase them online here. 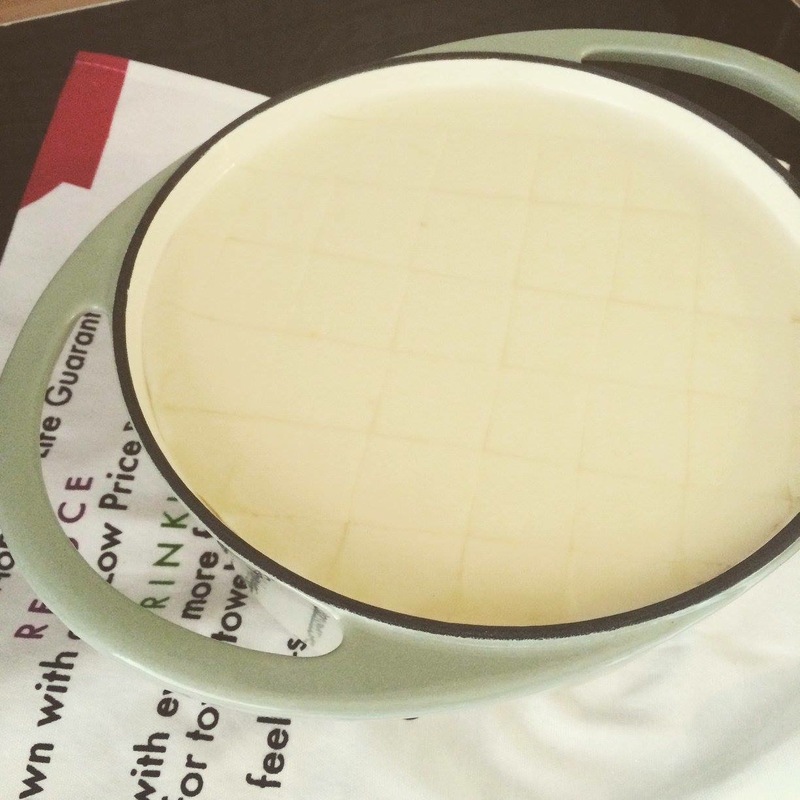 Have you ever made your own cheese? What was your experience like? Let me know in the comments below or Tweet/Facebook me! I was provided with a kit by The Big Cheese Making Kit for review purposes but did not receive any payment. All views are my own. Next PostA Gourmet British BBQ!